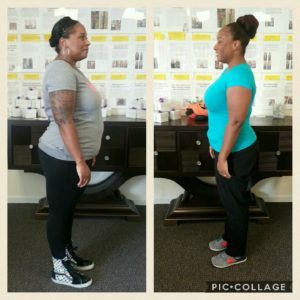 I Lost 19 Pounds/ Improved Energy and Sleep! The main symptom that brought me to Alternacare was weight gain that would not go away. Orthopedics diagnosed me with exercise induced compartmental syndrome. I could not exercise without my leg swelling to the size of a small watermelon and becoming heavy to move. My family practitioner referred me to an orthopedic because of the swelling of my legs and joint pains. The Orthopedic basically had me go through physical and aqua therapy only to tell me that we’d have to cut my facia in both legs in order for me to feel relief. At my worst I felt hopeless and helpless. I felt that I had no more choices. I looked in the mirror and saw a “blob” so I ate more to mask my feelings. Others looked at me as if I wasn’t trying. They would say all you have to do is exercise but that wasn’t easy. I was moody and in an out of stages of disappointment and depression. After I received care at Alternacare I started seeing a lot of physical differences. I am making healthier eating choices. My dairy free guide meal plan has helped me plan meals better, eat more veggies and fruits and just have an overall better feeling about myself. People who see me every day have noticed the difference and my will power to maintain my plan. 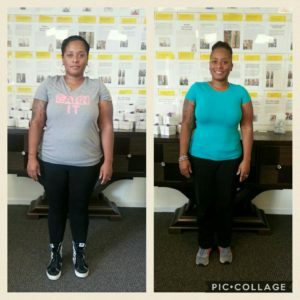 I lost 19 pounds and counting, I have more energy, improved sleep and reduced anxiety.